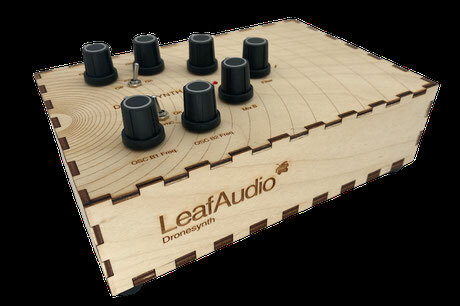 / Drone Synth - leaf-audios Webseite! Drone Synth features four CMOS logic gate based oscillators, a mixer, filter and a VCA. It has two channels with two oscillators each, which can be synced, what leads to interesting sounds with rich overtones. The volume of the oscillators is then mixed by two knobs and goes further to the filter, which is a Tilt-EQ (combination of low- and highshelf). Then the sound passes the VCA (amplifier), which normally is completely opened by an internal control voltage (CV) so the unit is a drone synth. But you can also use external CVs (from LFOs or envelopes etc.) to play the sounds of the Drone Synth rhythmically! We managed to get 35 more of the Drone Synth's VCA chips, then they are not available anymore. For this last run we are designing a wooden box now (march 2019) in the same style as our Soundbox. After 6 years we want to offer the Drone Synth a worthy farewell. Pictures will be posted possibly later in march.